“I remember the last time The Rock came to Samoa.” This was the way Indian Missionary Thanpuii began her sermon during a Monday morning assembly during first term, and it was a testament to her expertise in Samoan pop culture. Morning assemblies are usually held entirely in Samoan, but Thanpuii spoke English, and students paid rapt attention. 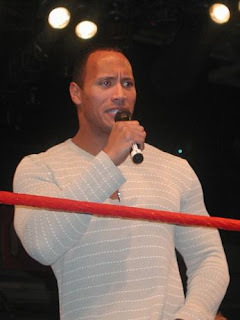 The Rock is far and away Samoa’s favorite son, and his popularity here remains extremely high. The Rock is only half Samoan, but Samoa doesn’t mind. Between his bulky, brawling personality and his impressive eye brow muscles, the subtle shout-outs to the homeland are much appreciated. That said, The Rock was not born in Samoa. In fact, he was actually born in Hayward, California. Note: I feel like I know someone else who was born in Hayward and is beloved by Samoa. I’m pretty sure he’s also charming, witty, and attractive... His name escapes me though. In any case, love for The Rock runs deep in Samoa. When “Race to Witch Mountain” was released, it opened at Magik Cinema (the only movie theatre in the country) the same day it opened in The States. It showed on all 3 screens. I don’t know how lucrative this was for the theatre, but it certainly makes a statement about national pride. There is an autographed picture of The Rock hanging in McDonald’s, which is kind of a big deal here. McDonald’s is a very special place here, and it’s difficult to gauge whether McDonald’s reputation is helped by having The Rock’s autograph on the wall, or vice versa. Either way, it’s a match made in Samoan heaven. Perhaps the best part of The Rock’s worldwide success is he provides an easy, common cultural frame of reference. It’s somewhat similar to the moon: despite light pollution, we see the moon in America, we’re familiar with it, we know when it rises and falls. Samoans are also familiar with the moon. So it is with The Rock. That’s what I mean when I say Thanpuii’s use of The Rock was brilliant; the kids worship the guy, and it’s not too far of a jump for them to assume that Thanpuii probably does too. Well played, Laura. Well played. Tomorrow’s Cultural Exploration: Electric fans. I hope you’re charmed, entertained, and attracted. Pictures below. 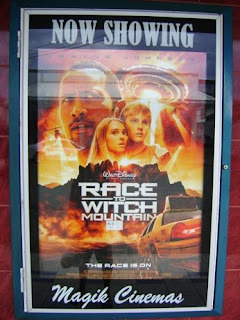 Magik Cinemas touting the very exciting release of Race to Witch Mountain. The Rock's autograph hanging at McDonald's. i was lol at "beloved by Samoa" excellent! His mum was Ata Maivia. She was the daughter of Peter Maivia. Because of the royal blood, Malietoa Tanumafili 2 bestowed the title of Seiuli on the Rock. When you drive from Apia to the airport, you find his name on one of the villages. I am still laughing at your sidenote :) ..